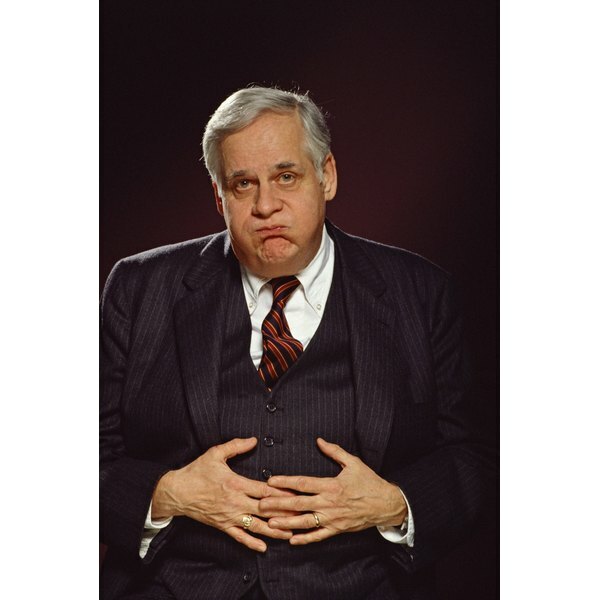 Indigestion, digestive upset and dyspepsia describe a general feeling of discomfort in your intestinal tract. Stomach upset is not a disease, but its symptoms, which include burping, flatulence, nausea and bloating, can indicate underlying problems such as ulcers and other health conditions. Laboratory tests suggest that honey aids digestion and that honey and cinnamon show antibacterial activity against H. pylori bacteria, which can cause gastric ulcers. Clinical trials have not supported these findings, however. One clinical trial showed that 6 g of cinnamon taken with meals slows gastric emptying rates, which may help prevent and manage type 2 diabetes. Talk with a health professional before using any home remedy. According to Mayo Clinic, you don’t usually need to worry about mild indigestion. Heartburn is in a separate category and is not considered to be a symptom of indigestion. Consult your doctor if you experience mild indigestion that lasts longer than a couple of weeks or notice a decrease in appetite, unintentional weight loss, difficulty swallowing, severe pain, a yellowish tinge to your skin or eyes, repeated vomiting, bloody vomit or stools, or black, tarry feces. Honey’s antibacterial activity is primarily due to its acidic pH and generation of hydrogen peroxide, but New Zealand manuka honey contains a distinctive antibacterial agent, methylglyoxal, from the manuka bush. Hydrogen peroxide degrades in the stomach, but MGO does not, according to a 1994 study reported in the “Journal of the Royal Society of Medicine.” The study showed that manuka honey was effective against five strains of ulcer-causing H. pylori bacteria, while another honey with antibacterial activity primarily due to hydrogen peroxide showed no statistical effect. Both honeys stopped bacterial growth. A clinical trial reported in the April 2010 edition of “The British Journal of Nutrition” showed that manuka and another honey had no effect on intestinal bacteria in the study group. Twenty healthy individuals between the ages of 42 and 64 ingested about 1-1/3 tbsp. of manuka honey every day for a month. Pre- and post-study microbial DNA testing was conducted on patients' stool samples to assess intestinal bacteria levels. Statistical analysis showed no changes. While laboratory studies have shown that concentrated cinnamon extract is effective against H. pylori bacteria, a 2000 clinical trial reported in “Helicobactor” showed that cinnamon extract was ineffective against the ulcer-causing bacteria in people. Fifteen H. pylori-infected patients between the ages of 16 to 79 years ingested 40 mg of cinnamon extract twice a day for four weeks. A second group took a placebo. Urea breath tests found pre- and post-trial bacteria levels of 22.1 and 24.4 in the cinnamon-extract group and 23.9 and 25.9 in the control group, leading researchers to conclude that 80 mg of cinnamon extract per day was not effective against H. pylori. One 2007 clinical trial showed that 6 g of cinnamon eaten with meals delays stomach emptying, which may help lower post-meal blood sugar levels, according to “The American Journal of Clinical Nutrition.” Stabilized blood glucose levels may help prevent and manage type 2 diabetes. A second clinical trial conducted in 2009 studied the effects of 1 g and 3 g of cinnamon ingested with meals. The GER of healthy test subjects who ate rice pudding with and without 1 or 3 g of cinnamon showed that 1 and 3 g of cinnamon did not affect GER or blood sugar, but 3 g reduced after-meal insulin levels, suggesting a relationship between the amount of cinnamon ingested and decreased insulin levels.